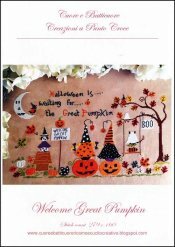 Welcome Great Pumpkin [G1435] - $13.44 : Yarn Tree, Your wholesale source for cross stitch supplies. Cross stitch pattern by Cuore e Batticuore. Halloween is....waiting for the great pumpkin! Welcome to the pumpkin patch with pumpkins of all sizes & colors! Two large pumpkins sit in the middle of this design with a witch sitting on each top. Next to the "Welcome great pumpkin" sign, is a dog dressed in a witches costume, sitting on top of his dog house. Colorful leaves adorn the tree with a cat taking a swing in the cool fall breeze. Look closely at the moon, you will find a small bird dressed up as a witch for Halloween. This is "Welcome Great Pumpkin." Stitch count 279 x 160. Stitched on #3643 Zweigart 36ct. Edinburgh Linen Light Mocha or #4071 Zweigart 36ct. Edinburgh Linen Vintage Country Mocha.